The Gundam Breaker series has danced around the edge of my radar ever since I heard about the first game back in 2013. Gundam in general isn’t something I’ve spent much time with, but the idea of a video game designed around those Gundam model kits (“Gunpla”, as they’re commonly known) with a focus on mixing and matching parts sounded fascinating. 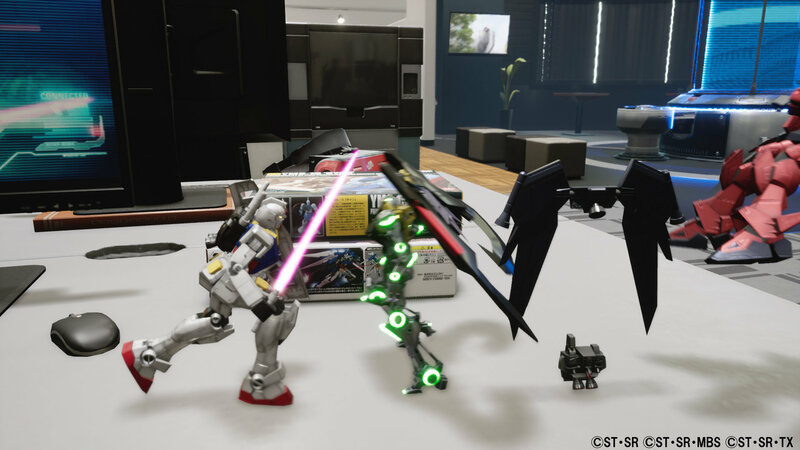 Until now, we haven’t seen a Gundam Breaker get a Western release, but with New Gundam Breaker, Bandai Namco have brought their Gunpla-themed series to a global audience. It’s a shame, then, that New Gundam Breaker is such a disappointment. By most accounts, the first three games are very good, but the one that’s meant to be Gundam Breaker‘s introduction to the West is, to be blunt, a broken mess. (And no, it’s not an issue of cultural differences—New Gundam Breaker has been very poorly received in Japan as well.) A lacklustre story, woeful game design, unreliable controls, a confusing UI, and a camera that constantly gets in the way all combine to make this one of the most frustrating games I’ve played in a long time. That’s a shame, because the concept at the heart of New Gundam Breaker is as good as ever. Set in a future where battling toy robots is high-profile enough to have whole schools dedicated to the sport, you play as a new student in one such academy. All the pieces are there for the sort of teen drama, humour, and coming-of-age stories that make so many other high school stories work. Add Gunpla battles to that, with to-scale models duking it out across classrooms and hallways like a mecha twist on Small Soldiers, and you’ve got what should be a wonderful game. It just never really gets there. The story, for its part, never really amounts to much more than a series of cliches and bland characters. Everyone is an anime tropes, without ever subverting or transcending that—there’s the childhood best friend girl-next-door, the hot-headed bully, the serious student president, the klutz, and so on. Archetypes are fine, and you’ll find similar characters in all the most acclaimed high school anime, but New Gundam Breaker never lets anyone be anything more than a cliche. The plot itself is very pedestrian, too: someone’s going around stealing Gunpla parts, so you and your growing crew of friends set out to stop them. The narrative is delivered in a visual novel format, which is fine—anyone who knows me knows I love visual novels, and I’d never hold that against a game. New Gundam Breaker‘s problem is that the choice of font and oddly-textured dialogue windows make the text difficult and painful to read. In a visual novel, that’s pretty much a cardinal sin. For the most part, the story exists as a way of stringing together a series of Gunpla battles that make up the bulk of the game. This is where everything really falls apart, to the point that New Gundam Breaker is borderline unplayable unless you have the patience of a saint. Battles typically play out in a 3-on-3 format, though there’s almost always a swarm of neutral bots running around. The result is unmitigated chaos, with so many mecha caught up in the brawl that it’s impossible to keep track of what’s going on. The camera makes things even worse, giving you a far narrower view of the battlefield than you’d expect and swinging about like a drunken sailor every time you move. Locking onto selected targets doesn’t seem to do much except make the camera controls even more fiddly. When it comes to actually fighting, the whole game feels like it’s taking place underwater. Mech movements are sluggish to a fault, and there’s an odd sort of input delay on your every action—even something as simple as jumping or swinging your weapon. Even if you can react to the myriad of attacks coming from your every blind spot, you can’t rely on your Gunpla to keep up. One of New Gundam Breaker‘s selling points is the ability to remodel your Gunpla on the fly in mid combat with parts knocked off enemies. In practice, it’s just another layer of nuisance, with multiple layers’ worth of menus just to compare stats on different parts—all while the battle continues to rage, and you continue getting attacked. Parts drop frequently, but your inventory space is very limited, so actually engaging with this system basically involves running around picking up pieces and dropping others, back and forth, until you find the ones you like. You can put some items into storage, but doing so means finding your team’s parts chest, which constantly relocates around the battlefield for no apparent reason. In most instances, battles aren’t simply a case of defeating the other team; instead, you have to earn points by doing things like knocking out other players, taking down the neutral mechs, and completing different objectives that pop up. Again, that’s an interesting concept—there are many roads to victory, and all that—but the execution of it just falls to pieces. How many points do different tasks reward you with? I never quite figured that out. Meanwhile, an unintuitive UI makes it very cumbersome to keep track of the quests that pop up, or to get a bigger picture of how the match is going. In short, playing New Gundam Breaker is an exercise in frustration, and then some. It’s a real shame, because there are clearly a lot of great ideas underneath it all. Every now and then, you get a glimpse of what the game could have been, as you take a fully functional, lifelike, pint-sized mech into combat across an array of desks, or take cover behind a pot plant. But it’s so rare to see moments like that that aren’t clouded by unresponsive controls, an actively unhelpful camera, unclear objectives, and ill-thought-out game design across the board. 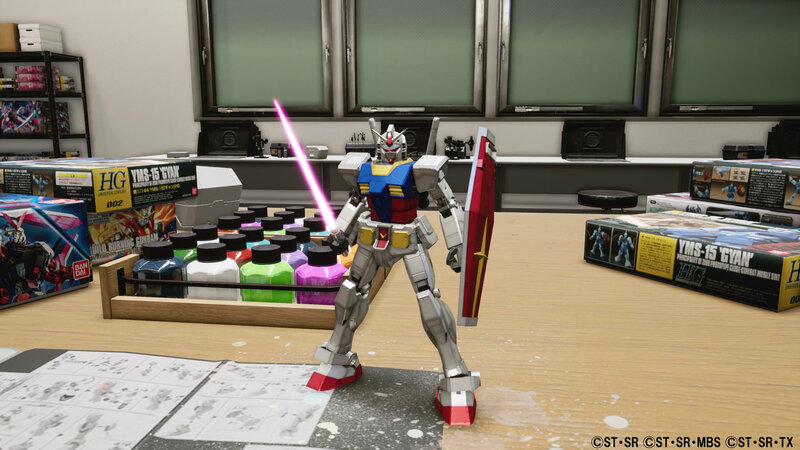 Bandai Namco has announced plans to address concerns, but it’s going to take a lot of work to get New Gundam Breaker into a decent state. For now, it’s nothing but a disappointment. 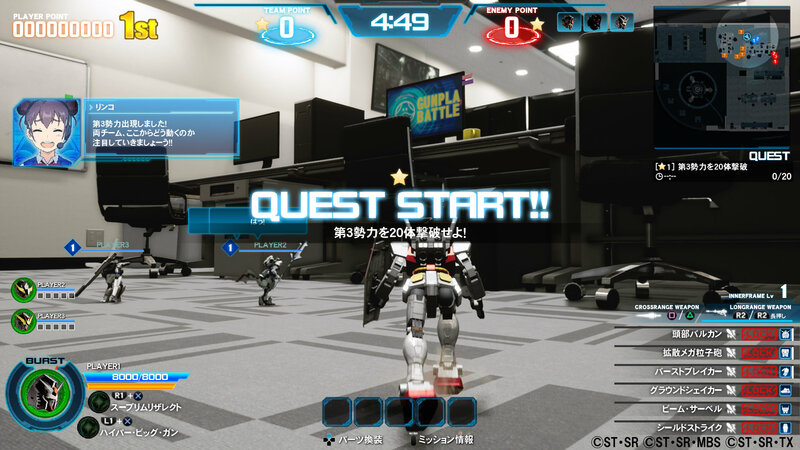 New Gundam Breaker is developed by Crafters & Meister and published by Bandai Namco Entertainment. It’s available now for PlayStation 4 (reviewed).